I’ve always believed that supermarkets are the best place to play the pick-up game. Bars and clubs are unoriginal, expected, and often bothersome. But a flirtation in the oil and vinegar aisle, on the other hand, is surprisingly refreshing and thoroughly endearing. You can gather more reconnaissance on a stroll past the cereals than during a 5-minute speed date. How a person moves through the produce section is extremely revealing, and a quick survey of a person’s shopping cart items easily helps you determine compatibility. Plus, there are few conversation starters as effective as a mutual interest in wild sockeye salmon recipes. 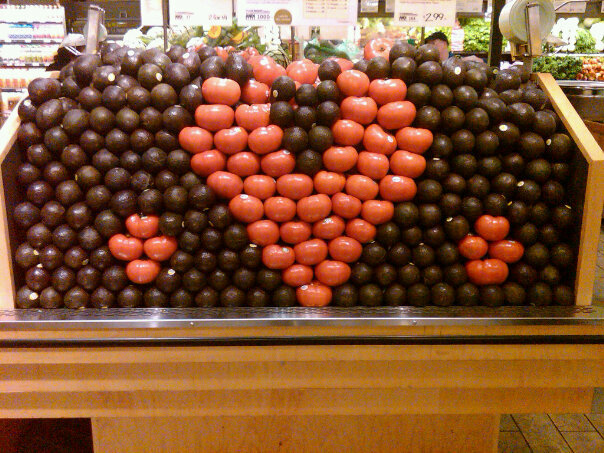 Yes, Whole Foods is the new OkCupid. Today, I found an admirer while stocking on my Stoneyfield Farms maple-vanilla yogurt. There were smiles and waves before we went our separate ways, crossing paths and waving again in front of the wheels of parmigano regiano and the shelves packed with tea. Finally, as I waited in line for my iced latte, I felt a tug at my shopping basket. Before I could turn around, a white fluffy blanket hit my face. I’ve had some pretty forward advances in my time, but no one’s ever thrown their bedding at me before… at least, not in public. He was pretty serious. “I think I’m a little old for you, tyke,” I said as I handed the toddler back his blankie. Okay, so it wasn’t the 6′, blue-eyed, dark-haired, wedding-band-less 30-something who smiled at me when I crashed into him while reaching for a head of radicchio, but this toddler dug me. And attention from a cute boy, even if he’s in a diaper, should never fail to flatter.